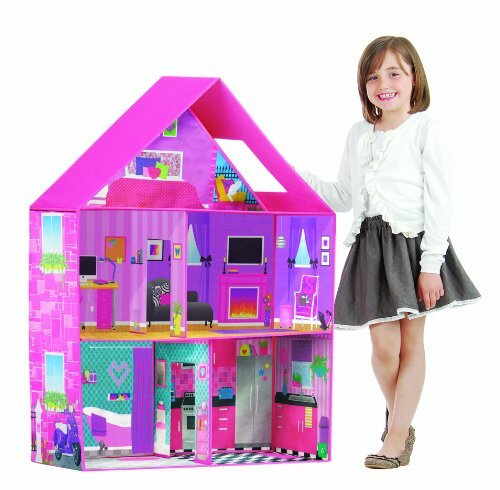 Help expand your child’s imaginative play and creativity with Calego’s Modern Doll House. Standing at nearly three and a half feet tall when assembled, this gorgeous pop-up doll house contains 5 different rooms within its three stories. The colorful dollhouse is illustrated inside and out with all the detail of a real home. Your child will enjoy staging fun scenes in the kitchen, bathroom, study, living room, master bedroom and outdoor terrace. All the walls are fully printed with traditional style wallpaper, furniture, books, and more. The only thing this house needs is someone to call it home. Calego doll houses are constructed from soft, safe materials and can be assembled without any tools. Velcro color coded tabs and Calego’s Colormatch system make assembling this dream house so easy a child can do it. When playtime is over for the day, this lightweight doll house folds up quickly and easily, making storage a breeze.